Sales Manager, Chris Lawson, said: “The Beach show home demonstrates the high quality of finish that buyers can expect it also gives them an opportunity to realise the space that these new homes offer. All the homes have been specifically designed so that the internal layout maximises the available space. The homes offer a high spec finish that includes modern fitted kitchens some with integrated appliances, open plan living spaces, garages and turf to the front garden. Buyers can also select from our extensive range of additions to create a bespoke feel for their new home, which we will fit ready for the move in day." Amongst the homes Bellway are building are a selection of contemporary four bedroom detached properties that start in price from £244,995. The foot print of the homes range in size from 969 sq ft up to 2,085 sq ft. Buyers at Taylors Wynd will benefit from a host of local amenities. The centre of Morpeth is less than 10 minutes away by car and boasts a vibrant shopping district with high-street and independent stores, as well as a number of cafés, traditional pubs and restaurants. The development benefits from quick access to the A1 linking you north to Edinburgh or south to Newcastle which is a mere twenty minute drive away. For families moving to Taylors Wynd, there are a selection of well regarded local schools including Stannington First School for younger children. There is also a school bus service which runs through the village to Morpeth, where primary schools include Morpeth Stobhillgate First School and Morpeth All Saints CE First School. Older children are catered for by a mixture of middle and high schools, such as, Morpeth Newminster Middle School and The King Edward VI Academy. The countryside setting of Taylors Wynd provides an ideal opportunity to enjoy a variety of outdoor pursuits such as cycling, riding and rambling. There are two golf courses within three miles of the development and the local market town of Morpeth benefits from having its own leisure centre complete with swimming pool and gym. For established families wanting to move to Taylors Wynd, Bellway can help sell your old home using there free of charge Express Mover service. Bellway will arrange an independent survey of your old home and arrange for an estate agent to take over the hassle of selling it yourself. Buyers can also take advantage of the Government’s Help to Buy scheme which only requires a five percent deposit. The Government will then provide a twenty percent five year interest free loan which means that you only need a seventy five percent mortgage. “This has been a tremendously successful scheme, helping more people to join the housing ladder much earlier than they expected and also to upgrade to larger homes than they imagined would be possible, “ said Chris. 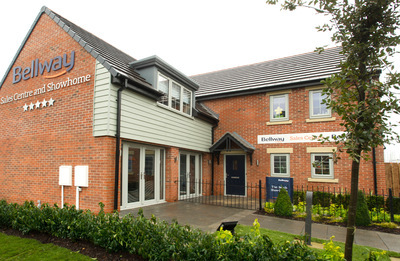 For further information regarding these new homes in Hepscott, visit bellway.co.uk. Sales office is open Friday – Monday 11.00 to 5.30 Thursday 11.00 to 7.00, closed Tuesday and Wednesday.